The decision is in regarding the eligibility of Alabama’s prized basketball recruit. Trevor Lacey was cleared by the NCAA and will be in uniform this season for the Crimson Tide. UA released a statement just after 10:30 a.m. Thursday confirming the news. It ends a few months worth of speculating on his academic standing after a highly-contested recruitment. Lacey, a Butler High grad from Huntsville, committed to the Tide in May after being pursued by Auburn, Kentucky and Kansas among others. Expectations are considerably high for one of then nation’s top recruits. Questions about his grades persisted and it was until today, the second day of the fall semester, when the final news came in. Now with Lacey officially set to play this winter, the preseason hype surrounding the Tide will only accelerate. Lacey was the final piece of coach Anthony Grant’s prized recruiting class that, combined with returning stars JaMychal Green, Trevor Releford, and Tony Mitchell, has Alabama climbing preseason rankings. The Anthony Grant teleconference just ended and we have quite a bit to report. To make this easy, let’s use bullet points. Injury 1: Tony Mitchell had arthroscopic knee surgery in April to take care of tendinitis and “loose growth” in his left knee. Injury 2: Trevor Releford had surgery to correct a sports hernia that he played with most of the season. Injury 3: Ben Eblen had a deviated septum. The concussion issue for Andrew Steele sounds like a serious one. He suffered one in the SEC tournament loss to Kentucky. It was his second concussion while at Alabama and fourth of his career. Grant said he was talking with Steele family to decide best plan of action moving forward. In recruiting news, Grant said he expects all six members of the signing class to be eligible for the upcoming season. JaMychal Green and Tony Mitchell were invited to summer tryouts for the U.S. national team playing in the World Basketball Games. Carl Engstrom will play on the Swedish U-20 team this summer. Read the print edition tomorrow for more details including the back story from newest signee Retin Ojomoh. 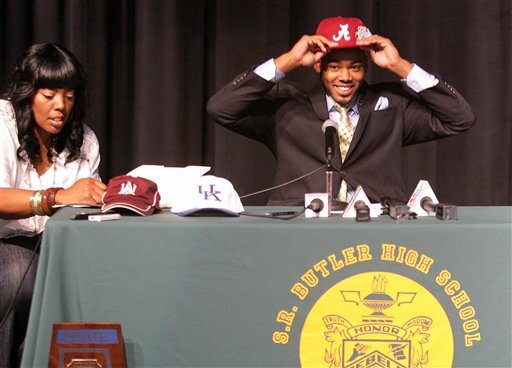 HUNTSVILLE — Buzzing with anticipation, the auditorium at Butler High quickly fell silent Wednesday afternoon when Trevor Lacey reached for the paperwork. Opening the manila folder, grabbing the pen and signing his name, the Parade All-American ended one of the longest recruitments in recent memory when leaning back to the microphone. “And I just signed with the University of Alabama,” he said reaching for the crimson cap before him and drawing a loud ovation from those waiting on edge. The five-star prospect picked the Crimson Tide over one-time front-runner Kentucky, late-entry Kansas and in-state rival Auburn. The recruitment clock was ticking for the two-time Mr. Basketball since the spring signing period ends Friday. He was the nation’s top unsigned player before faxing his paper work to Tuscaloosa. Buy a newspaper or read the rest here or here. Also checkout Decatur Daily sports editor Mark Edwards’ column found here. Butler High School coach Jack Doss was far from conservative when talking about the talent Trevor Lacey will bring to Tuscaloosa next season. A few legendary names crept into his responses to questions from reporters. Earlier he spoke about the attention Lacey drew from opposing defenses. I was pretty confident when announcing my plans for this afternoon. A first attempt at a live streaming broadcast sounds like a good idea since broadcasting rights were not sold for today’s college announcement from Trevor Lacey. All was working relatively well. Then Lacey stepped to the microphone and all went haywire. I suspect the cell phone network was overloaded at that moment because several other news organizations appeared to be attempting the same live stream. Either way, my connection went kaput and you were left in the dark. I apologize to anyone who was depending on my blog to deliver the news. I failed you this time, but I learned a thing or two about making it work for the future. Thanks for understanding. Here it is. The quality isn’t the best, but here’s the gist of it. Check back later for what he said after the paperwork was completed. Click here for all Alabama recruiting stories. Now, here’s Lacey discussing his decision. Alabama basketball coach Anthony Grant just released a statement through the school regarding the announcement made by Trevor Lacey just a little bit ago. He’ll play in Tuscaloosa and Grant’s certainly glad to have him. Check back later for video from the signing and tidbits from the wild announcement. We’re just three hours from one of the most anticipated college basketball recruiting announcements in some time. Butler High School’s Trevor Lacey, the nation’s top unsigned recruit, will reportedly chose between Alabama, Auburn, Kansas and Kentucky at 2 p.m. CDT in Huntsville. Check back later for The Daily Bama Blog’s first attempt at a live streaming broadcast from the big event. All it takes is an iPhone and a signal these days. See in a few hours. The video won’t go live until close to 2 p.m. I’ll let you know if it happens any sooner. I couldn’t make it home to Louisville this weekend, but Alabama signee Levi Randolph made it to the Derby City for one of the nation’s premier all-star events. Click here to see his winning performance in the dunk competition of the Derby Festival Basketball Classic — an event loaded with McDonald’s All-Americans. He scored a perfect 40 on his second dunk in front of 10,000-plus fans at the new KFC Yum! Center. Fellow-Huntsvillian Trevor Lacey was also in town. Still deciding between Alabama, Kentucky and Kansas, Lacey went just 2-for-8 from the field. Lacey spoke to the Courier-Journal about the recruiting process here.